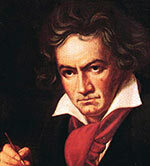 Ludwig van Beethoven (1770 – 1827) is one of the most widely respected composers of classical music. He played a crucial role in the transition from classical to romantic music and is considered one of the greatest composers of all time. Beethoven was born 16 December 1770 in Bonn (now part of Germany) From an early age, Beethoven was introduced to music. His first teacher was his father who was also very strict. Beethoven was frequently beaten for his failure to practise correctly. Once his mother protested at his father’s violent beatings, but she was beaten too. It is said, Beethoven resolved to become a great pianist so his mother would never be beaten. Beethoven’s talent as a piano virtuoso was recognised by Count Ferdinand Ernst Gabriel von Waldstein. He sponsored the young Beethoven and this enabled him to travel to Vienna, where Mozart resided. It was hoped Beethoven would be able to learn under the great Wolfgang Amadeus Mozart, but it is not clear whether the two ever met. Mozart was to die shortly, but Beethoven was able to spend time with the great composer Joseph Haydn, who taught him many things. Rather than working for the church, Beethoven relied on private donations from various benefactors. However, while many loved his music, they were often not forthcoming with donations and Beethoven sometimes struggled to raise enough finance. His situation was made more difficult by his mother’s early death and his father’s descent into alcoholism; this led to Beethoven being responsible for his two brothers. Beethoven was widely regarded as a great musician, though his habits were unconventional for the social circles which he moved in. He was untidy, clumsy and (by all accounts) ugly. All attempts to make Beethoven behave failed. On one occasion, Beethoven pushed his way up to the Archduke saying it was impossible for him to follow the many rules of social behaviour. 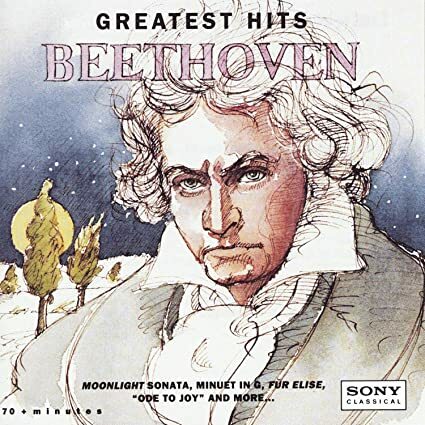 The Archduke smiled and said – ‘we will have to accept Beethoven as he is.’ Beethoven himself had great faith in his own capacities, referring to the princes at court. 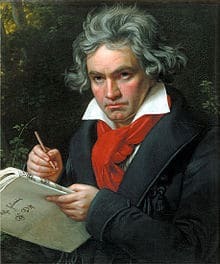 Beethoven’s music was also unconventional, he explored new ideas and left behind the old conventions on style and form. His freer and explorative musical ideas caused estrangement with his more classical teachers like Haydn and Salieri. From his early 20s, Beethoven experienced a slow deterioration in his hearing, which eventually left him completely deaf. Yet, despite his deafness and the frustration this caused him, Beethoven was still able to compose music of the highest quality. He was still able to inwardly hear the most sublime music. However, his deafness meant he struggled to perform with an orchestral backing, as he often fell out of time. This caused the great pianist to be ridiculed by the public, causing much distress. As a result, he retreated more into his private world of composition. Despite his deafness and outer frustrations, his most widely admired works were composed in this difficult last 15 years. This included the great works Missa Solemnis and the Ninth Symphony – both finished shortly before his death. The Ninth Symphony was groundbreaking in creating a choral symphony from different voices singing separate lines to create a common symphony. The final part of the symphony (often referred to as “Ode to Joy”) is a symbolic musical representation of universal brotherhood. It was a fitting climax to Beethoven’s unique musical creativity and life. Beethoven was a supporter of the Romantic movement sweeping Europe. He was going to dedicate a great symphony to Napoléon, whom Beethoven believed was going to defend the ideals of the French Republic. However, when Napoléon’s imperial ambitions were made known, Beethoven scratched out his name so powerfully, he tore a hole in the paper. Symphony No. 9 in D minor, including well known “Ode to Joy”. Beethoven died on March 26th, 1827. The precise cause of death is uncertain, but, the accumulation of lead poisoning is believed to have played a role. Over 10,000 people are said to have lined the streets for his funeral. 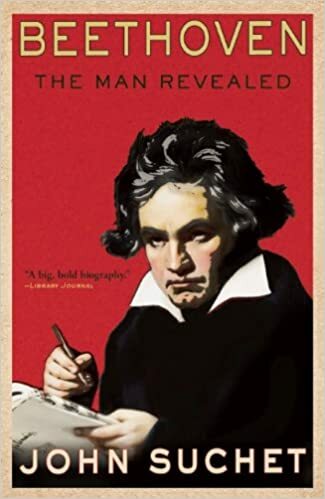 Though Beethoven had a difficult temperament, and although his music was sometimes too visionary for the general public, Beethoven was appreciated for his unique contribution to music. Citation: Pettinger, Tejvan. “Biography of Beethoven”, Oxford, UK. www.biographyonline.net, 28th May 2008. Last updated 1 February 2018. Famous Classical Composers – A list of famous and influential composers throughout history, including the greatest composers, such as Bach, Mozart, and Schubert.